rec. Snape Maltings, Suffolk, UK, October 2012 and St John's Smith Square, London, January 2014. This SACD is arranged as a concert. Each of the three short vocal works is prefaced by a Symphonie or Sonate acting as an overture, as it would have been in the original performances. Everything is beautifully performed by members of the London-based baroque music ensemble La Nuova Musica and recorded in two of the UK's finest recording acoustics, St John's Smith Square and the Snape Maltings. It is not specified which work is recorded in which venue but since the clean and clear sound lacks much by way of an acoustic signature it really does not matter. The surround channels are little more than quiet versions of the front three adding a manufactured spaciousness which is pleasing to the ear. Recording engineer Brad Michel has done his job unobtrusively and well. The piece by Carissimi is longest and last on the disc. It was composed for performance at the Sant' Appolinare church in Rome where he held a life-long appointment as maestro di capella to the Jesuit Collegio Germanico. Such music had no generic title but is a precursor to the oratorios brought to their highest point by Handel almost a century later. Charpentier studied with the older Carissimi and took the form with him back to France where he too worked for the Jesuits. Charpentier was never able to make the breakthrough to fame and fortune in opera, being firmly held back by the powerful and self-serving Lully. Charpentier therefore worked for the church and the aristocracy rather than the court. 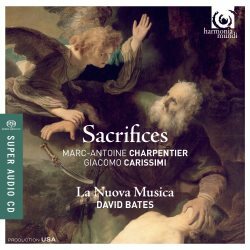 All three pieces, each on the subject of sacrifice, thus the name of the disc, are a pleasure to hear, performed as they are by skilled and experienced members of this excellent ensemble. The erudite and detailed notes by Gawain Glenton, himself a prominent player and singer on the European baroque scene, point out that the characterisation and dramatic embellishment of these biblical stories was down not only to the composer's skills but also to those of the performers. In Carissimi's and later Charpentier's times the opera also supported all the skilled singers that were needed by the church for their work of publicising the message of Christianity. Those attending performances in church were likely to be just as enthralled by soloists of quality as were those in the theatre. The line-up of singers here is impressive and gives all the colour and drama needed. De Brossard's 'overtures' are enjoyable in their own right and provide yet more evidence of the extraordinary depth of musical talent present in seventeenth century Italy and France. The rule would appear to be, never ignore music simply because one has never heard of the composer. Charpentier and Carissimi have established reputations to which this lovely issue simply adds lustre. Buy this, sit back and enjoy.